Sony plans associated with PlayStation mobile gaming in the future seems far more limited than XPERIA Play, which is here first introduced the PlayStation Suite. The Sony looks like supplying many PlayStation games for Android mobile phone users, including game store will provide. In order to start it all, Sony's plan would launch PlayStation One emulator (not a PSP emulator), which will enable Android device can play games from the PS1 console. Party third-party developers will use environtmen development of Sony's gaming output, to ensure that the game will work flawlessly on all Android devices, both smartphones and tablets. Also, can walk on the PSP2, if true this gaming gadget will be there. 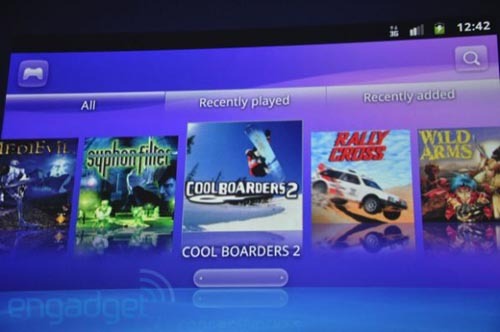 For devices which was not accompanied by the control panel like the XPERIA Play games, game development will lead to a touchscreen-based control. Well, if everything is ready then the game shop Sony, PlayStation Store will begin to open, the facility can shop directly from the phone. Unfortunately, the official price of those games that will be on display in stores until now unknown. For Android smartphone manufacturers, who want their products can use the games are available at game stores must obtain certification Sony PlayStation, where in order to maintain its quality. Until now there has been no related image compatible devices. However, it is expected XPERIA Arc Play and was nominated.